This recipe came about as a result of trying out my shiny new Multi-function mincer by Judge. 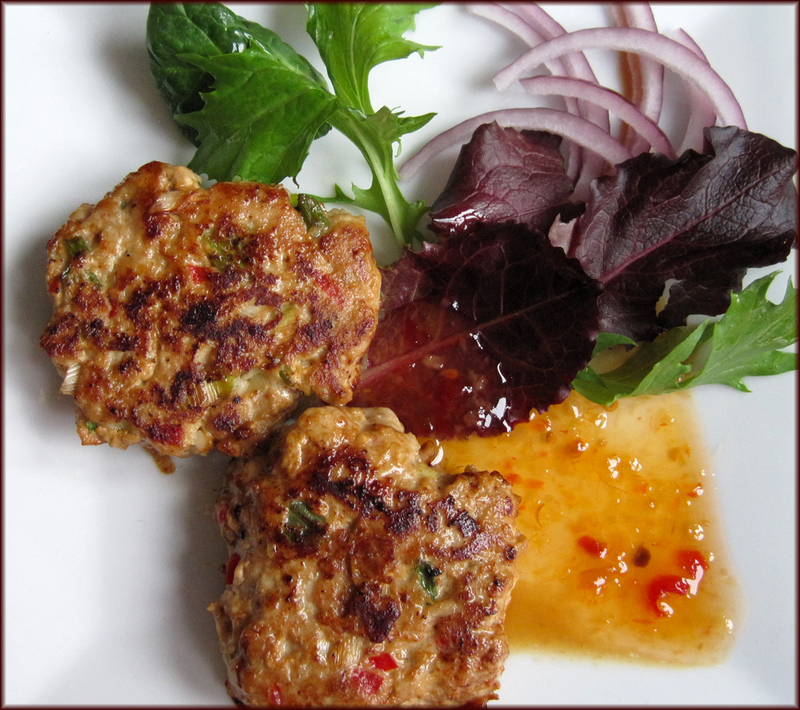 I had to mince something to test it out and as pork came to mind - sweet chilli pork patties had to happen. I never buy pre-packed ready made burgers because you just don't know what you're going to get. I always buy good quality mince but it has to be said there's nothing better than to mince your own meat so you know exactly what you're eating! 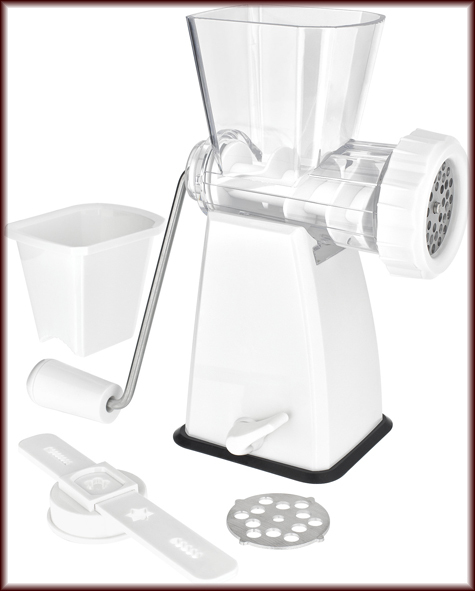 This easy to use hand powered rotary mincer by Judge has steel mincing plates giving you the choice of course and fine. It also comes with a four-shape cookie press. It is relatively easy to clean although the mincer isn't dishwasher safe and so personally I'd recommend using an antibacterial spray after washing and before rinsing again. The mincer was easy to assemble. There's a clamp to hold the mincer in place whilst in use. It will stick to many different work surfaces - I tried wood and that worked too. However, I found the rubber suction doesn't work for more than a minute or so without making the rubber bottom damp and the instructions didn't mention that. Paul the husband that never ever cooks a thing, said it was obvious to him that you would need to make it damp.....Okay, well he was correct and the problem was remedied in a second! Once the rubber bottom was made damp by wiping with a cloth the mincer wasn't moving for anyone until you released it by the clamp of course. Ten out of ten for good grip! 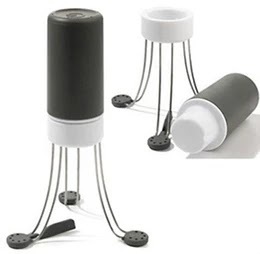 Too easy to use - cut your choice of meat into cubes trimming off any fat and pop into the top along with the plunger thingy. This was one of the pork loin steaks I used to make the patties. Attach the handle, and away you go. Make pork patties knowing you're eating only good things. I never buy pre-packed ready made burgers because you just don't know what you're going to get; far better to make your own. 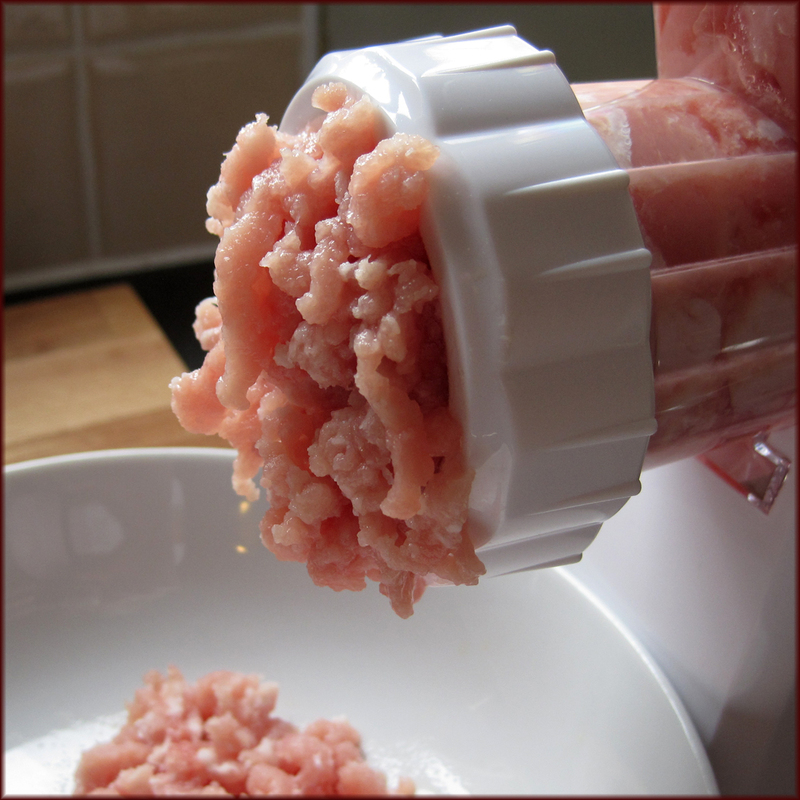 Chop your ingredients and either mince your pork loin steaks in the Judge Mincer (after removing all the fat) or use ready minced pork with a low fat content. Put the mince into a bowl along with the spring onions, chilli, garlic, egg yolk, Mirin and Ketjap Manis along with a good pinch of salt and black pepper. Mix together well but don't over mix or the mixture will become 'over processed' and look quite horrid. 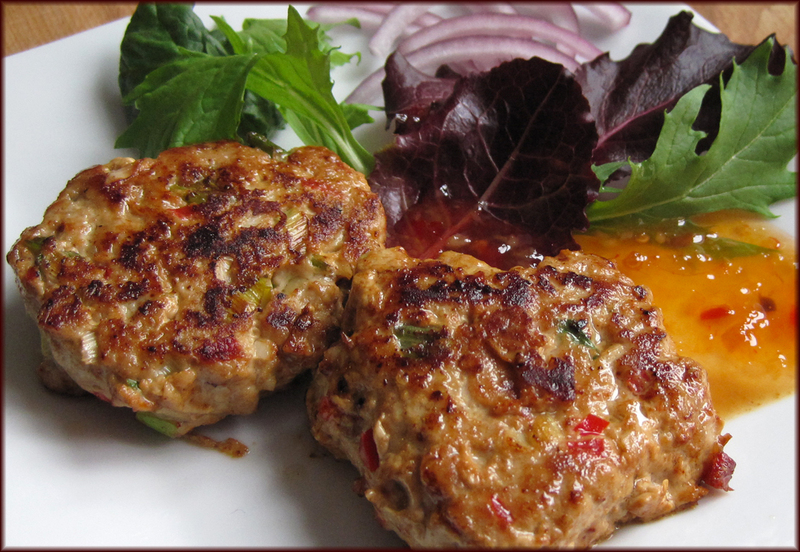 Shape into 6 or 7 small patties or of course 2 nice fat burgers - whichever takes your fancy. Heat up a frying pan large enough to cook them all at the same time. You can fry a tiny amount of the mixture and have a taste to check the seasoning if you wish. Fry the patties until they're nicely cooked through. The exact time of course will depend on how big you make them, so I'll leave that to you to decide. Whatever, don't over cook as there isn't any fat they will soon end up dry. 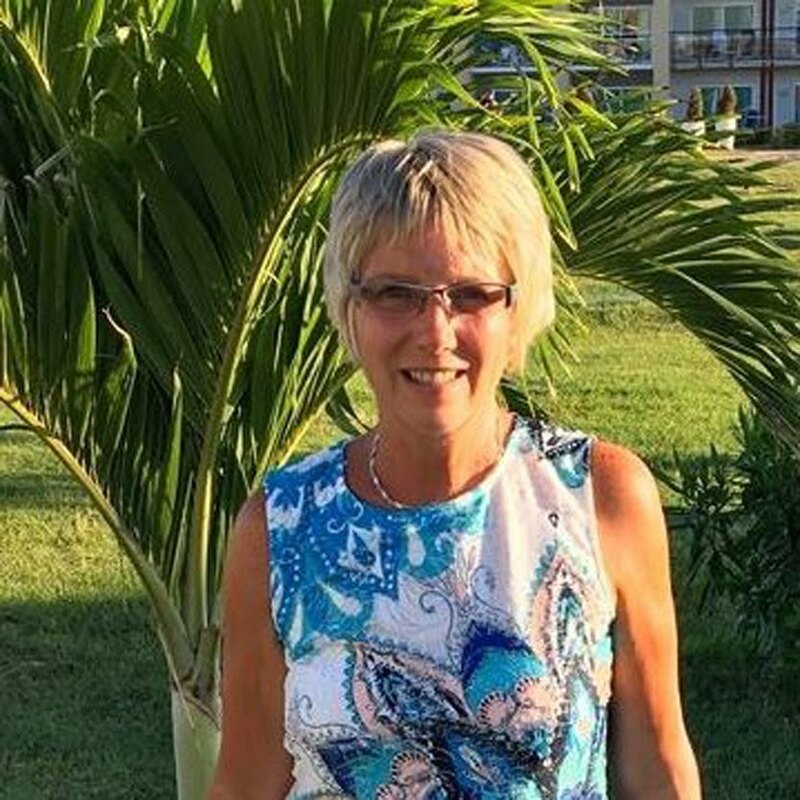 I served my patties in warm pitta bread with salad and skinny chips. I didn't realise you could get a mincer for £16, that's great! You're soo right about not knowing what's in the mince sometimes... I may have to invest! 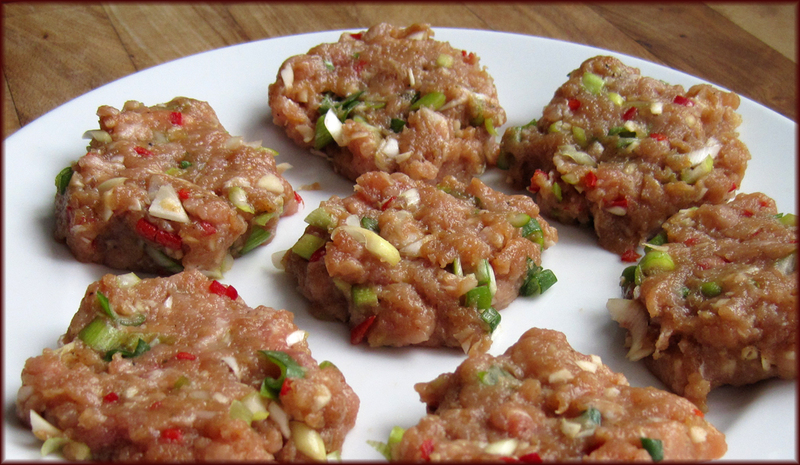 I am so addicted to sweet chili sauce and these pork patties would go well with some.